The Chief Minister, Mr Bhupinder Singh Hooda, today expressed his anguish over the “partisan and exaggerated” coverage of the last week’s incidents in Gurgaon involving the police and Hero Honda workers. The Union Minister of State for External Affairs, Rao Inderjit Singh, today put the blame for the labour unrest leading to violence in Gurgaon squarely on labour from outside Haryana employed in Honda Motorcycle and Scooters Ltd.
Six persons were killed and 16 were injured, when a Canter in which they were travelling collided with an oil tanker near Dhangar village in the district today. All victims belonging to Petwar village of Hisar district were followers of the Dera Sachcha Sauda sect. The ill-fated Canter with its body detached from the chassis after it collided with an oil tanker near Fatehabad on Sunday. Cracks have developed in a number of residential houses in Ward No. 10 of Kalayat Town, 25 km from here. It is learnt that the cracks in the houses have been caused by leakage in the water pipes laid by the Public Health Department. Thousands of residents living in the industrial area, Prabhu Nagar and the mandi went without electricity for 26 hours at a stretch since yesterday following shifting of a transformer from the industrial area to Rohtak Road by the Uttar Haryana Bijli Vitran Nigam. Ten persons, including eight women, died and seven others were injured when a truck plunged over their tempo while overtaking them near Kulana village, on the Jhajjar-Rewari road here today. The police arrested three Youth Congress leaders with a local woman under suspicious circumstances near Hansi township in the district late last night. The arrested persons include a secretary of the state Youth Congress and the president and general secretary of the rural unit of the district Youth Congress. Mr J.S. Shinde, general secretary of the All-India Chemist and Druggist Association, today opined that there is a need for uniform medicine pricing throughout the country. Mr Shinde along with association president R.B. Puri were in Ambala to inaugurate the office of the Haryana Chemist and Druggist Association. Artistes from Ambala, Hisar and Fatehabad enthralled an appreciative audience at a cultural evening organised by a local organisation ‘Samarpan’ here on Saturday. The cultural evening was organised to mark the death anniversary of famous singer Mohammad Rafi. Addressing the 26th annual convention of the Haryana Union of Journalists (affiliated to the National Union of Journalists) here, he said the media, especially some television channels, put out highly exaggerated casualty figures without bothering to verify the facts with the appropriate authorities. Mr Hooda said what upset him most was that the coverage was so “superficial” that no one bothered to go into the factors that led to the ugly confrontation. “I am sorry but nobody took notice of the fact that there were some forces in the state which were trying to disrupt the process of foreign direct investment which had begun to pick up after his government came to power,” Mr Hooda said. Mr Hooda, who appeared visibly disappointed with the reports, said such coverage seriously affected the credibility of the media in the long term. He said since the judicial probe was underway he would not like to elaborate on the issue. “But I am sure the truth will force all of you to do some introspection so that this is not repeated,” he added. Without directly naming the Left parties, he said there were parties who were following dual policies – one for their own state and the other for the rest of the country. This was not good for the country, he quipped. The Chief Minister said competition among newspapers and electronic media channels was largely responsible for the aberrations in the role of the media. He pointed to the rising tendency among newspapers to publish advertisements in news format, especially at the time of elections. Such practices must be curbed immediately if the media was to continue to play its role of a watchdog, he said. He said despite wider reach the media was still obsessed with cities and politics. “The changes sweeping the countryside and the problems of the rural masses must also be taken note of. The world has shrunk in recent years and the events in one part of the world affected even remote corners of some other country. Let us together find ways to make the media more meaningful to the changing society,” Mr Hooda said. He announced institution of an annual award for Haryana-based journalists in memory of the late Satya Pal Saini, a former Staff Correspondent of Dainik Tribune. Mr Hooda assured that “false cases registered against journalists would be withdrawn and a journalists welfare fund would be set up after working out the modalities”. The convention’s opening session was presided over by Mr Naresh Kaushal, officiating Editor, Dainik Tribune. In his speech, Mr Kaushal lamented the exploitation of journalists by newspaper owners. “It is a paradox that the persons who expose the exploitation of others are themselves being exploited. It is time governments ensured the journalists got their due,” he added. Mr Kaushal also regretted the falling standards of language in Hindi newspapers. He said it was the responsibility of every Hindi journalist to ensure that proper language was used in the reports. Mr S. Krishnamurthy, CEO, Grasim Suitings group and chairperson of the reception committee of the HUJ, said the media and the industry together played an important role in changing society. He suggested closer ties between the two. Rao Inderjit, on the basis of his geographical roots theory, concluded that had the majority of the labourers in the firm been of local origin, the situation would not have gone out of control. They would have approached the local leaders for solving the problem. This would have prevented the incident from aggravating, he added. He was critical of the role of the electronic media for its alleged “biased” and exaggerated account of the development relating to the violence. Putting things in perspective, he said as the land used for industrialisation was of the local persons, they should be given preference in employment in the factories set up here. Rao Inderjit Singh’s statement comes in the midst of allegation from certain quarters that a couple of senior leaders of the Congress had helped in employing their supporters in Honda Motorcycle and Scooters Ltd during the period when the management had shut the doors on the workers for adopting confrontationist approach with it on their demand, especially for revoking the suspension and dismissal order against their 54 colleagues. He said that the deadlock between the management and the labour went out of control of Haryana as trade unions of the Left parties at the national level fished in the troubled waters. Also, other political opponents of the Congress tried to exploit the situation to suit their vested interests. There is apparent embarrassment in the Congress camp with wide-ranging allegations that factionalism in the organisation prevented it from countering its opponents at a political level. While Rao Inderjit Singh was abroad, the local Congress MLA was away to Singapore on private visit. The incident started on July 25 and he retuned on July 28. Significantly, he is the Gurgaon (Urban) president of the Congress. The Haryana Minister for Labour, Mr Birender Singh, did not visit Gurgaon during the crisis period. The Minister for Industries also did not visit Gurgaon. The only Cabinet Minister from the area, Capt Ajay Singh, also did not make his visit. According to reports, the victims, who included men, women and children, were going to Dera Sachcha Sauda in Sirsa in a Canter. When their Canter reached near Dhangar village, 8 km from here, an oil tanker coming from the opposite direction hit it on one side. The back of the Canter, where the victims were sitting, was badly damaged. Five persons — Ajay (10), Phoola Devi (85), Om Pati (55), Chando Devi (65) and Munia (10) — died on the spot. The highway police and some other followers of the Dera Sachcha Sauda sect, who were coming in another vehicle, rushed 17 injured persons to the local general hospital. Six critically injured persons, two girls aged 12 and 16, Som Nath (49), Leela Ram (40), Ram Kumar and an unknown person were referred to the Agroha Medical College, where Ram Kumar succumbed to his injuries. Monica (13), Manoj (36), Raju (7), Sarbati Devi (60), Ruchi (10), Kailo Devi (45), Sukhbir (58), Pardeep (52), Sonu (10), Vijay (35) and Pinki (35) were admitted to the local general hospital. The local MLA, Mr Dura Ram, visited the injured persons in the hospital and offered all help to the injured and kin of the deceased. He condoled the death of victims and expressed deep shock over the accident. The injured were later shifted to various hospitals in Hansi by their relatives. The SP, Mr Bhim Singh, and the SDM, Mr Yogesh Mehta, rushed to the site and supervised the rescue work. The District Red Cross secretary, Mr Naresh Jhajhra, also reached the hospital with three ambulances and supervised the shifting of critically injured persons to the Agroha Medical College. Followers of Dera Sachcha Sauda reached the hospital in large numbers and offered all help to the victims. 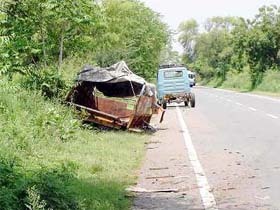 The accident site near Dhangar village presented a gory sight. Blood soaked clothes of the victims were strewn all over the place. Two pieces of human skull were also seen lying on the roadside. The canter driver, Rajesh, and two other persons — Dharambir and Sandip — who were travelling in the driver’s cabin, had a miraculous escape as the main chassis of the vehicle was not at all affected by the impact of the collision. They told mediapersons in the local general hospital that the body of the ill-fated canter flew off the chassis and fell at a distance. They said timely help by the followers of dera saved many lives. The accident has again brought to fore the apathetic attitude of the administration towards goods vehicles carrying people. Though it is quite unsafe and even unauthorised to carry people in trucks and canters, followers of the Dera Sachcha Sauda can be seen moving in such vehicles very frequently. The dera followers visit the dera every Sunday and are ferried in goods vehicles like sheep and goat. Thus the occupants of the vehicles become more vulnerable in case of an accident. A number of affected persons have alleged that appearance of cracks in the walls of their houses and damage to the flooring has occurred due to leakage in the water supply pipelines. Following their complaint, a Junior Engineer of the Public Health Department visited their area and confirmed the leakage in water pipelines. The residents have expressed concern over the use of cement pipes as water pipelines as these pipes, they say, are unable to bear heavy load and crack under the pressure of passing vehicles. They have demanded compensation from the government. In a similar complaint, Ashutosh, son of Mr Hanumant Singh, a resident of the local Rang Mahal locality, has filed a civil suit against the local municipal council, the Public Health Department and the state government in the court of the Civil Judge, Ms Bimlesh Tanwar. He has demanded adequate compensation for damage caused to his house due to leaking water pipes and cracks in the drains adjoining his house. The court has issued notice to the department officials concerned to appear in the court and file their reply. According to a report, this has paralysed the normal life and business activity in the area. The residents also faced inconvenience on account of non-availability of power as they have to fetch water from distant places to meet their requirements. Many residents alleged that the officials of the UHBVN had failed to provide information about the stopping of power supply because of shifting of the electric transformer. All the deceased, who were travelling in the tempo, were members of the family of Kudia Ram of Balor village near Bahadurgarh town of the district. According to information, 17 persons, including eleven women and a child, were going to Gadra village in Rewari district to mourn the death of a relative. Most of the occupants were sitting in the rear portion of the tempo while some male members were sitting in the cabin. However, when they reached near Kulana village, a truck which was following their vehicle, tried to overtake them. The driver of the truck lost control and the truck badly crushed the tempo. The accident occurred at about 11.30 am. The bodies of the victims were handed over to the relatives later this evening and were consigned to flames amid gloomy atmosphere in Balor village. The police has registered a case against the truck driver who escaped from the spot after the accident. The arrested persons include Praveen Kumar Dhanak, secretary of the state Youth Congress and a former municipal councillor, Rajender Sharma, alias Bunty, president of the district Youth Congress (Rural), and Ranjeev, general secretary of the district Youth Congress (Rural). Ranjeev was formerly associated with the Haryana Pradesh Vyapar Mandal. These Youth Congress men, along with a woman of the local Patel Nagar area, were arrested near Hansi late last night. A black Santro car (Registration No. HYT-24) was also impounded by the police. Initially, on being interrogated by the police, they tried to conceal their identity. One of their accomplices managed to escape. The district police chief, Mr Arshinder Singh Chawla, confirmed that the police had registered a case under Section 109 of the CrPC in this regard. All three “leaders” were today produced before the Subdivisional Magistrate, where they were granted bail. The police officials investigating the case kept on getting a number of phone calls to let off the leaders. However, the police did not succumb to political pressure and registered the case. Mr J.S. Shinde, general secretary of the All-India Chemist and Druggist Association, today opined that there is a need for uniform medicine pricing throughout the country. Mr Shinde along with association president R.B. Puri were in Ambala to inaugurate the office of the Haryana Chemist and Druggist Association. Among others, Mr R.K. Khera, Mr Ram Mohan Sharma, Mr Satish Vij, Mr Sandeep Nagia and Mr Raj Kumar Sharma were present. Mr Shinde observed that uniformity in drug prices would prove to be beneficial for patients. There are five lakh medicine retailers in India and the medicine business is about Rs 30,000 crore annually. He said there were seven states in India where VAT continued to be 10 per cent. “For the past one year, we have been having talks with these state governments. Now, we have told them that if they do not bring down the VAT to four per cent, we will hold demonstrations,” he said. Mr Shinde said the government should not charge local taxes over and above the maximum retail price. He said the VAT on surgical items continued to be 12.5 per cent and it should also be brought down to four per cent. He stressed that Indian medicines were comparatively cheaper than those available abroad and of quality. Artistes from Ambala, Hisar and Fatehabad enthralled an appreciative audience at a cultural evening organised by a local organisation ‘Samarpan’ here on Saturday. The cultural evening was organised to mark the death anniversary of famous singer Mohammad Rafi. Mr Subhash Sharma, a former Principal of the Daya Nand College, Hisar, has recently formed the organisation to give impetus to cultural activities in the area. Though almost all singers impressed the audience by performing memorable numbers sung by late Mohammad Rafi, a duet “Leke pehla pehla pyaar”, from the film CID by Anil Sharma and his wife Rajnish Sharma was appreciated a lot by the audience. As many as 329 cases were disposed of in a lok adalat organised at the district courts under the presidency of the Additional District and Sessions Judge, Mr S.K. Gupta, here yesterday. Nishit Arora (8), son of Mukesh Arora, a resident of Model Town, was crushed to death by a private bus near Kaithal Club on the Ambala road here this morning. He was taken to a private nursing home but was declared brought dead. His body was later taken to Civil Hospital for a post-mortem examination and later handed over to his family members.